Key takeaway: Spicy peppers use bird droppings to disperse their seeds because birds have iron stomachs and buttholes. I was reading this awesome infograph about insanely hot peppers and was intrigued to find out that birds are impervious to spice! In fact, crazy hot peppers need birds to disperse their seeds because birds, unlike mammals, don’t have molars and therefore keep the seeds intact (instead of grinding them down to powder). Key Takeaway: Crows are freaking scary. They’re smart. Crows are considered one of the most intelligent birds and are known to use tools (sharpen twigs and other objects) to forage for insects and larvae. There have also been studies that indicate they may be able to count up to 3 or 4. They’re predators and scavengers. Crows’ diets consist of insects, mice, roadkill, frogs, even eggs and nestlings of other birds. A group of crows is called a MURDER. You know why?? Because a group of them will sometimes kill a dying cow. I recently moved in to a house at the top of a very large hill that looks over a preserve. In my backyard I can find tons of wildlife including little bunny rabbits, deer, and beautiful birds. In fact, since I have moved, I’ve become quite a bird enthusiast which just makes me feel a bit old. But I’m embracing my new found interest of birds with this Daily Smart Fact. 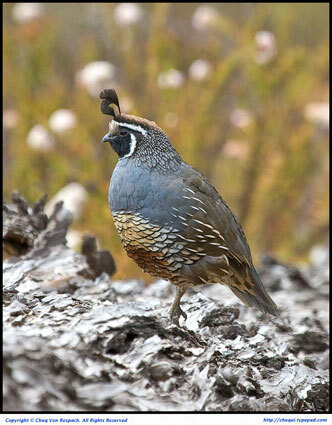 I’m ashamed to admit that I only recently learned that the California State bird is the “California Quail.” A friend mentioned it to me in passing when I told her that there were tons of quail behind our house with funky king-like feather caps on top of their heads. They also wake me up every morning with their loud calls. They scurry around every morning pecking at the ground, eating closely with their brown bunny brethren. And thanks to this blog, I have been inspired to learn a little more about them. Pairs of California Quail call antiphonally, meaning that the male and female alternate calls, fit them into a tightly orchestrated pattern.